You've made up your mind. You're going to take the plunge and start your own business. Good for you. You've set up a home office. You've shopped long and hard for a computer, printer, and telephone. You've even stocked up on pencils, pens, and paper. You're ready for business. Not quite. To turn that PC into your personal bookkeeper, secretary, file clerk, forms maker, and more, you'll need software. But one trip to the store can shock your wallet. It's going to cost a lot to fill your computer's hard disk, especially if you're set on buying the big-name products. 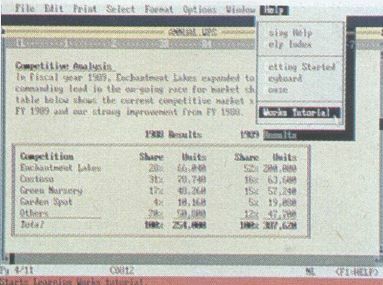 Lotus 1-2-3 runs $695 a copy, WordPerfect costs $495, and dBase IV … well, you don't want to know. You can put together a complete set of home business software tools for a lot less. For as little as $ 100, you can collect the essential elements you'll need to start up your home business and keep it running. All businesses spend their time getting, doing, and keeping business. Your home-based venture won't be much different. Every business communicates with customers, tracks finances, records information, predicts profits, fills out forms, and schedules time. But your home business must do all these things more efficiently than your competition. As a startup, you have to make every contact count. Put it in writing. No matter how much time you spend on the phone, you'll still have to write to your customers, suppliers, and creditors. To communicate effectively on paper, you need a word processor. Watch your money. Put some accounting software on the job and you'll be able to track income and expenses to the last penny. Play with numbers. A spreadsheet helps you calculate loans, figure out how to squeeze more profit out of your operation, and even predict success or failure. Know your customers. You need a database to record information about customers, orders, and inventory. Budget company time. Your time is the company's time, so you'll want time management software to turn your computer into a scheduling secretary. Do the paperwork. Put a form-making program on your hard disk and toss out those generic forms. If you only have $100, start out simply. The cornerstone of your $100 kit should be Eight-in-One, an integrated package that combines many essential business tools into one. Its word processor is the package's strongest module. It's easy to learn and has features, such as a spelling checker and a thesaurus, that you wouldn't expect in a program at this price. The cost of these three startup software kits was based on street price, not suggested retail price. I consulted a number of mail-order software sellers and a major software superstore chain and averaged their quoted prices. Buying direct is your best bet. PC Connection, at (800) 243-8088, is one well-known mail-order software supplier. It had everything in the $500 and $1,000 kits in stock (though nothing from the $100 kit), with the exception of Top Priority, PC File 5.0, and Galaxy. MicroWarehouse, at (800) 367-7080, had all of the software in the $100 and $500 kits except Galaxy. Wherever you shop for your startup software, make sure you make a list. It might be tough staying within your budget if you don't. Eight-in-One also contains spreadsheet and time-management software. The spreadsheet offers mathematical and financial functions to project costs. Eight-in-One's calendar and to-do list tract appointments and priorities. Eight-in-One is an economical integrated package. 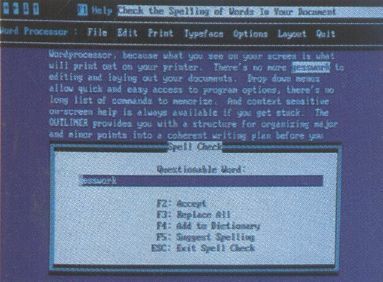 Its word processor features a dictionary and a thesaurus. Microsoft Works is a more advanced integrated package with a powerful spreadsheet and a helpful tutorial (shown). Quicken will keep your books for you, writing and recording checks and even paying bills electronically. XyWrite has a complete set of formatting feature. The fastest word processor around, it's the pick of many professionals. My Checkbook can handle simple accounting chores. It's a checkbook-writing and -register program that you'll be using a minute or two after installation. You can categorize expenses, do some elementary budgeting, and reconcile the account. Its biggest drawback is that it handles only one account. Although you could use Eight-in-One's database, I recommend a specialized program like My Advanced MailList instead. Don't underestimate this name-and-address list program—customer and contact information are vital resources. To make your PC easier to use, install Menu Works. It's an inexpensive program launcher and DOS substitute that automatically creates menus for you. You simply select from a menu and press a key to start up a program, load a file, or call a DOS command. The linchpin of the $500 kit is another integrated package: Microsoft Works. It costs more than twice as much as Eight-in-One, but it's easier to use and more smoothly integrated. Its spreadsheet is its strongest feature. Though you can get by with Works' word processor, I'd recommend you try Galaxy instead. 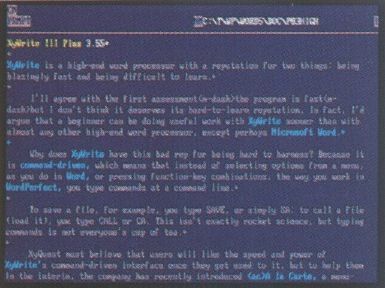 It has multiple windows, mouse support, menus, and a gigantic thesaurus, but it's still easy to operate. Plus, it's distributed as shareware, so you can try it out before you buy it. You can afford more versatile, powerful software with this kit, so pick Quicken for your accounting software. It writes checks, tracks jobs, and follows taxable expenses. 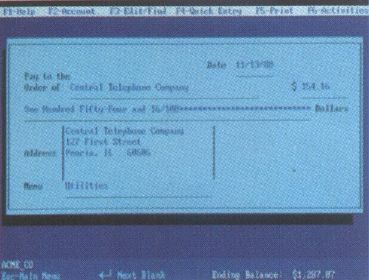 Quicken works from a familiar checkbook interface, though it's much more sophisticated than a simple checkbook program. Quicken lets you pay your bills through CheckFree, an electronic payment service. You can also afford to upgrade your database. PC File 5.0 is a flat-file database that takes in huge amounts of information and returns it to you in several forms. Although Microsoft Works includes a small calendar, use Top Priority instead to watch your time and schedule. Top Priority's to-do list should keep you on top of the details. Rather than pay for generic paper forms, make your own with Formtool. It provides complete control over every part of form design. PC Tools Deluxe 6.0 rounds out this startup kit. Though you may first use it to insulate you from DOS, it has far more to offer than MenuWorks. PC Tools includes utilities to secure your programs, back up your data, and repair damaged files—potential lifesavers for your home business. The $500 startup kit provides a solid software foundation, but if you have $1,000 in your budget, replace selected pieces of the $500 kit with higher-powered software that can handle your most demanding work. Then spend the rest of your money on programs to expand your business capabilities. If your work is word-intensive, replace Galaxy with XyWrite III Plus, a favorite of many professional writers. XyWrite has everything—superb formatting control, mail merge, multiple-column printing. Its new menu system makes it easy to use. Best of all, XyWrite is extraordinarily fast. Will your home business require substantial number-crunching power? If so, drop Microsoft Works' spreadsheet and opt instead for Quattro Pro. It's quick, it produces outstanding charts and graphs to dazzle your clients, and it handles huge worksheets. If your business depends on lists, replace PC File 5.0 with Q & A, a top-notch database/word processor combination. Q & A is much easier to work with than PC File. It lets you retrieve information by asking the program plain-English questions, a plus even for experienced database users. But don't replace all three of your power hitters unless you have to. Instead, substitute for the one you use most; then go hunting for some extras. Almost any home business could use a desktop publishing package. Express Publisher is perfect for creating newsletters or flyers. If you expect to telecommunicate, you'll want something like Procom Plus. It's inexpensive but has the advanced features you'll need. If you spend a lot of time on the phone making contacts, pick up Simply Ingenious, a simple-to-use database. It's great for storing contact names, telephone numbers, and the notes you take during phone conversations. It's possible that none of these software kits will fit your requirements exactly. Though each kit includes enough software to meet basic business needs, there may be some gaps only you can recognize. It's your business. That's why you're working for yourself. You call the shots, so make substitutions freely. Just remember to look carefully at your business practices and then buy the software tools that make those practices perfect. Gregg Keizer, a former editor of COMPUTE Magazine and former publisher at SoftDisk, is currently freelancing. He is the author of science-fiction stories and computer books.